“I belong to the highest class in the land- the working class- who keep those who neither toil nor spin”. Ted Leggatt, 1895. “One of the best-known of the anarchist open-air speakers at that time was Ted Leggatt, a big, burly Cockney carman, who played a big part in the Transport Workers’ Union. He was a man of the people, racy of speech, with a rich Cockney humour, and a stentorian voice, which he used to good advantage to proclaim his ideas. ... He would start his speeches with: "I am Ted Leggatt, the anarchist". He was a good fellow, and a good comrade, a frequent visitor among the Jewish comrades, who were always glad to see him”. Rudolf Rocker, The London Years. “The rebel agitator par excellence, with a constant desire to stir up revolt in the hearts and brains of his class. So far as he is concerned, his chief conceits are that he has ever been a fighter for the cause of the poor, and that he is uncle to Bombardier Wells(1). … Somehow or other Leggatt turns up in the thick of nearly every fight…Perhaps the happiest and most cheerful person in the world is Ted Leggatt when he, as hoarse as a raven and in husky voice, is telling everyone what he has done and what is going to be done”. Ben Tillett, The History of the London Transport Workers’ Strike, 1911. 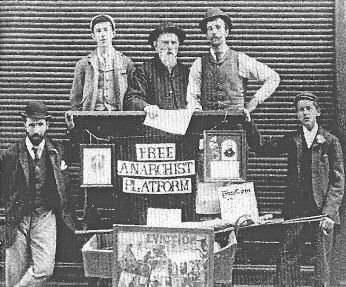 Edward “Ted” Leggatt (pictured above, top right) from East London was an early member of the Socialist League in its St George’s in the East branch, where he appears to have developed anarchist views. He worked as a carman (cart driver). He was one of those physically attacked by the police on the Bloody Sunday events in Trafalgar Square on November 13th 1887, and was arrested there and subsequently sentenced. During the dock strike of 1889 many carmen had struck in sympathy, and without assistance from a strike fund. As a result a Carman’s Union was formed and Leggatt became one of its two organising secretaries. After the collapse of the League, Leggatt was one of the organisers of the anarchist groups that sprang up in 1892, and was secretary of the Whitechapel Anarchist Group as reported in Commonweal. In 1894 the same paper was to report that he had been blacklisted by the East London wharfingers and had been unable to obtain work for ten weeks. Around this time Leggatt became associated with the anarchist-communist paper The Torch, initiated by the Rossetti sisters. It appears that he was involved in the intensive propaganda carried out by this group in the London docks. “I am an Anarchist, and refuse to recognise the right of a section of parasites, calling themselves shareholders, to make rules, regulations, and by-laws, own railways and monopolise the results of the united labours of thousands of working men, and then dictate upon what terms they should travel… I always ride first or second class, not because I wish to mix with the respectable or ruling classes, but because, as a worker, I want comfort, and prefer stuffed cushions to deal boards”. He received a prison sentence for this, subsequently speaking at a meeting on September 13th at the South Place Institute to welcome Emma Goldman’s visit, and entitled Political Justice in England and America . He stated that a magistrate was harder on an anarchist than on ordinary men, and asserted that he would continue to ride in comfort. He was a delegate from his union to the International Socialist Congress in 1896, where anarchists were physically expelled from the hall. Speaking up against this he quoted the old watchword "Proletarians of All Countries, Unite!" From 1909 Ted Leggatt became a full-time organiser for the Carman’s Union (The London and Provincial Union of Licensed Vehicle Workers, known as the “Red Button Union” because of its militancy) for which he was denounced by Guy Aldred in his paper the Herald of revolt as a “labour fakir”. He appears to have maintained his anti-parliamentary views and these became even more pronounced from 1912. Police reports indicate that he was at the forefront of struggles and The Times reported in July of that year that he had been arrested for using provocative language. Leggatt was a frequent anarchist speaker at the different open air pitches in London, as well as speaking at the anarchist clubs. For example he spoke at the Jubilee Street Club in 1909 on the Chicago Martyrs alongside Rudolf Rocker and Kaplan. He was a frequent visitor to the Jewish anarchist circles in London. By 1935, the year of his death, Ted Leggatt’s position in the union had transformed him into a typical trade union leader in the Transport Workers Union, according to a letter of 27th February of that year from Tom Keell to Max Nettlau, the anarchist historian. (1) Bombardier Billy Wells (born 1889) a well known boxer of the time. He was the original “anvil man” in Hammer films. Quail, J. - The Slow Burning Fuse.